Since Dallin has shown he is one tough guy, a.k.a. tri-athelete, PETE The CAT, the tough guy of the Club House Disney. 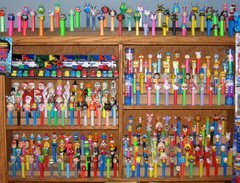 is donated to the PEZ collection in his honor. PETE is a new, never before issued character, in the long line of Disney/Mickey Mouse PEZ characters. p.s. This is the PEZ Dad bought at the L.A. Farmers Market. YES! The PEZ bunny left 3 new little friends in Sarah's Easter basket. The new RUBBER DUCKIE, the new PINK BUNNY FURRY FRIEND, and the CHOCOLATE BUNNY. . The CORNWALL COLLECTION currently has 6 (see above) of the 10 pieces possible (see below) in the Madagascar Series. The 2008 MADAGASCAR set added Skipper the Penguin and Melman the Giraffe to the 3 original characters (see PEZ Watch 9/08) . Gloria the Hippo looks much the same in the 2008 set, though the original stem was made in Hungary and the new version is made in China and may have a slight color variation. The Cornwall Collection currently includes the original Alex the Lion "a". Robb's recent acquisition added Alex "c" - which has a lighter yellow muzzle and a lighter tan nose and lighter head. 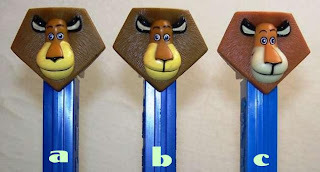 There is also a variation of the original - "b" - that comes with a line under his nose. The current Cornwall Collection includes Marty the Zebra "b" which has the smaller eyes. 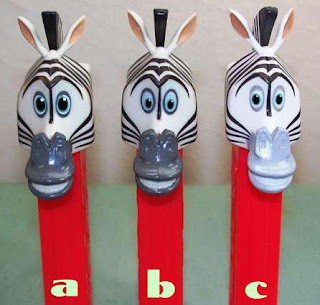 Robb adds Marty "c" which has a much lighter snout and the zebra's head is white instead of a grayish tint. The original also had a "large eyes" variation "a". Hippo - "made in China"